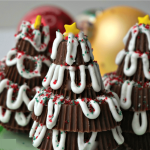 Peanut Butter Cup Trees make an adorable place setter on your table as well as a great after dinner treat. The whole family will have fun making their own. I always have fun over the Holidays. We get to visit friends, and I bake, which as you may know, I love! This year I decided not to make as much because it seems like we toss quite a bit of it after the holidays. Heaven knows John and I don’t need to be grazing on sweets for days and days! 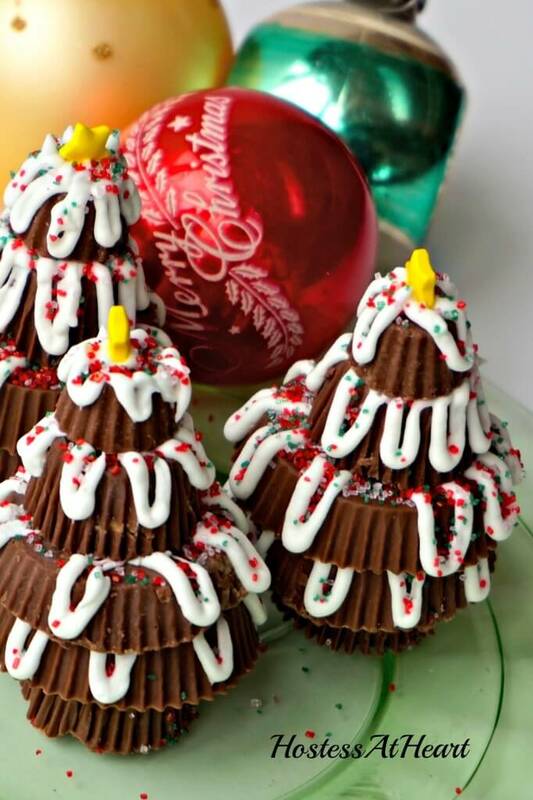 But, when I saw these cute little “Peanut Butter Cup Trees”, I couldn’t resist. I’m thinking they will look adorable on my Christmas dinner table. 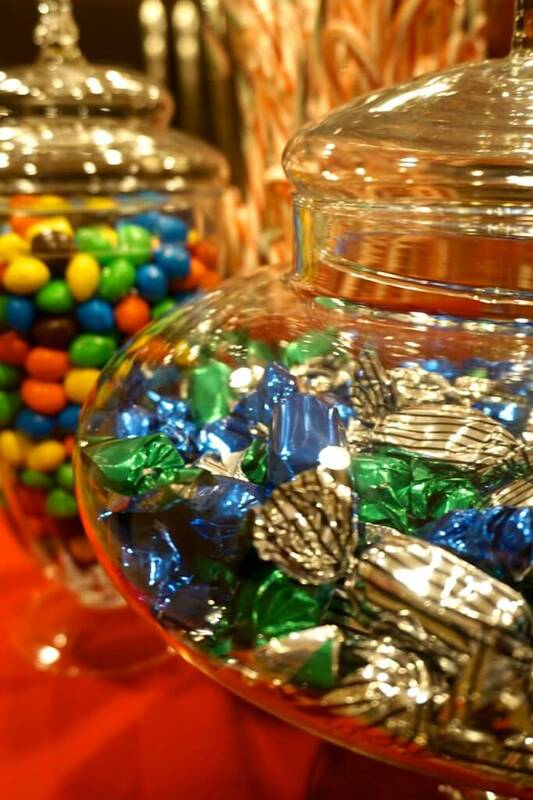 Each year I fill three glass containers with colorful candy. It makes a pretty decoration, and an easy treat. 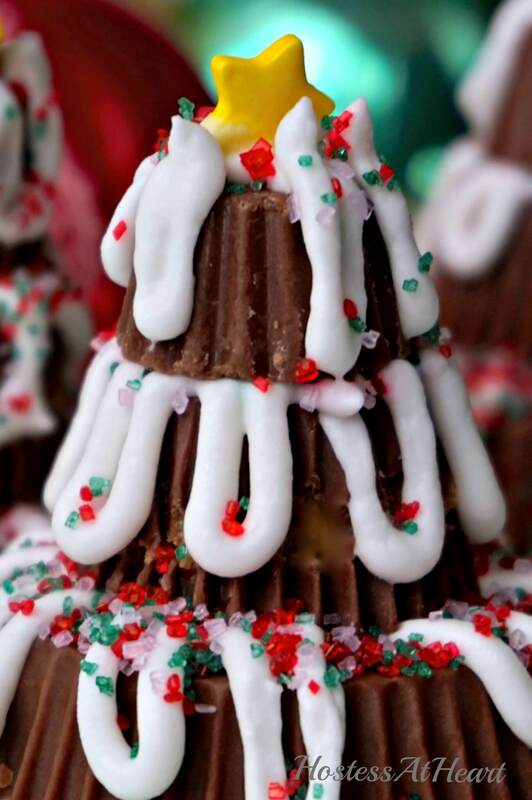 When I went shopping for the candy that I needed to fill my containers with… I decided that I would also pick up the peanut butter cups needed to make the trees. Who knew that Reese’s made so darned many peanut butter cup sizes? I am sure that the woman that checked me out thought I had a serious problem with sweets! Wouldn’t this be a fun activity to do with the kids? They can make their own table place setter and show off their work of art on the dinner table. Make sure you have plenty because the biggest problem is not eating more than what you need for the trees! Don’t have time Pin it for later! Combine ingredients in a large mixing bowl. Beat with an electric mixer on medium speed until smooth and fluffy, about 5 minutes. Add additional water to thin. Keep covered until ready to use. I use a wet paper towel but you could also cover with plastic wrap. Refrigerate the peanut butter cups for 15 minutes to chill. This helps to prevent damage when removing the candy papers. Spoon Royal icing into a ziplock or pastry bag. Press out excess air. Line a cookie sheet with wax paper. Unwrap peanut butter cups and line up the various sizes on the sheet. Snip a small tip from the icing bag. Place a miniature peanut butter cup bottom side up on your work surface. I used another lined cookie sheet for my work surface. It helped keep my sprinkles from going every which way, and I could just pick up the wax paper between trees and pour the sprinkles back into their bottle. Pipe a dot of royal frosting on top and attach one standard-size cup bottom side up. Pipe half loops to resemble snow, and add sprinkles. Add a dot of royal frosting and then add the snack sized peanut butter cup and repeat with icing, stacking with a second miniature cup and finishing with a mini cup. Attach a star (or topper of your choice) to the top with royal frosting. Repeat 11 more times. Store in a covered container in a cool place. Recipe adapted from Family Circle December 2014 issue. I hope you enjoy your Christmas. I wish you and your family peace and love. It’s always fun to share so let’s head over to Fiesta Friday and Saucy Saturdays! I made these for our family Christmas meal and set them as place setters on my table. They went over so well and were so much fun to make. I also put them in little Christmas themed bags and gave them to John’s employees. Now it’s time to come up with another idea! Thank you! I appreciate your stopping by! These are amazing, Julie! I want to try these next year, too. Pinning! So cute! I didn’t know Reece’s cups came in all those sizes. Did guests actually eat them? Happy New Year and Happy FF! Congratulations on the feature!!! Thank you Johanne on the feature. I was truly honored. They sure did eat a couple layers on their trees. I was amazed on all the sizes of Rees’s too. It took awhile compiling the sizes. I still have a few reinforcements for nibbling like I need them. Broccoli for a month would be better. They were cute on the table, and a few of them lost a couple branches after dinner. 🙂 Thanks for visiting! What a great idea! I love your creativity. I hope you had a very Merry Christmas, and I wish you a happy and prosperous New Year! Thank you so much! I did have a great Christmas. Happy New Year to you too! So cute! I’m pinning these! I think Reese’s needs to put these in their commercials. They are so cute and are my favorite store bought candy. A couple of them lost their tops immediately after dinner. 🙂 Thanks for stopping by Claudia! These are adorable, Julie. Wish I saw these before the Christmas frenzy forced me to go MIA… darn it! I’ll definitely remember these next year though! Thanks Nancy! They were fun and have now been given all away. I think I should just eat broccoli for the next 30 days :). LOL… you and me both! I was very, very bad over the last few weeks! Beautiful little trees – and the best ingredients! Thank you Hilda! So sweet of you to stop by. So cute and fun. Pinning for next Christmas. Thanks Tracey! Hope you had a great Christmas! Awe thank you Chitra! A few of them looked more like the leaning tower of Pisa though :). Thanks for visiting. I hope you are enjoying your weekend. These are super-cute! I will have to keep this in mind for next year! Thank you Nancy! They were fun to make! Thanks Michelle! I had a great holiday, and hope you did too! Thank you Michelle! I had an amazing holiday and hope you did too! They look cute and it’s a perfect idea for the festive season! Thank you so much! They “were” fun for our table. My sister-in-law made turkeys at Thanksgiving too. I guess we just like those peanut butter cups! I appreciate your stopping by. This is the cutest tree i have seen. What a creative idea. Looks very yummy too. That is so adorable! I think this is my husband’s dream coming true. Reese’s peanut butter cups are his absolute favorite! It sure was my son-in-laws dream come true! These are incredible. I basically just want to eat them all. Thanks Varina! They looked so cute on my Christmas table. Can’t imagine how you managed not to chomp them all down. These little Christmas trees are so cute Julie!! I just love this idea. These are so cute! What a great idea and yummy to eat!! You are welcome! I apologize to the slow response. I am 2 weeks post op TKR and just now feeling like blogging again. Happy Holidays to you!! Oh my that is a tough one! I am very happy that you are doing better. Welcome back and Merry Christmas to you and yours! These are so clever & festive Julie! Thank you! They are fun to make. Thank you Loretta! My family will enjoy them too. Oh my goodness, these are so cute! How creative! 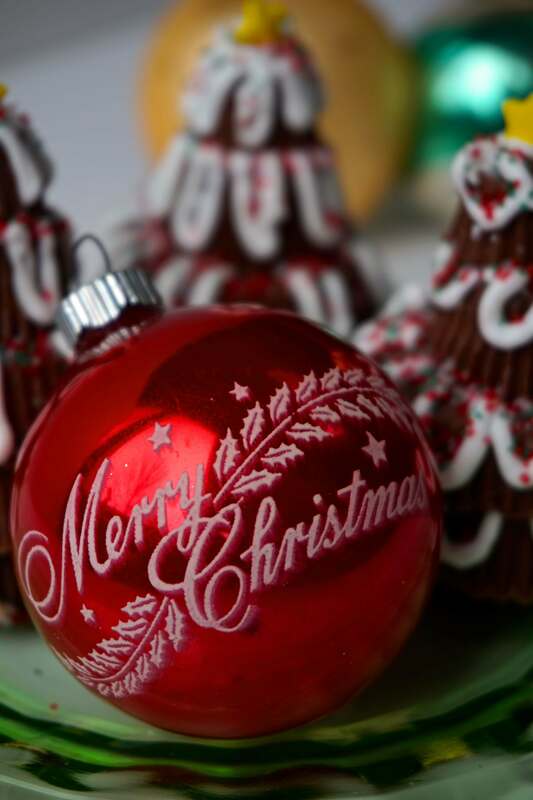 I want to wish you a Merry Christmas and Happy New Year! It has been great getting to know you this year! Have a wonderful holiday season filled with the love of family and friends! I wish you an amazing Birthday and Christmas my friend! I have both children here so my holiday is already wonderful! so cute, what a beautiful idea! Merry Christmas to you ! They sure were fun, and the cookies will be easier to eat. These will make for a sugar bomb! You have a great Christmas too! That’s such a beautiful and creative idea; I love those tree’s they look wonderful. Thank you. I think they are cute too!